Yamatozakura & Satsuma Shima Bijin Visiting NYC! - Kampai! : Kampai! Two master distillers from Kagoshima Prefecture are visiting the NY area the week of July 25 to July 30th (schedule below). 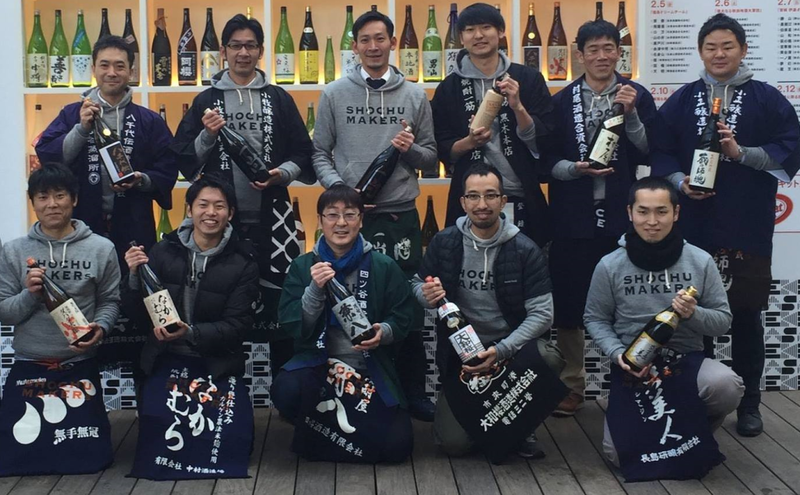 Naoki Sugimoto (bottom right in photo above) from Satsuma Shima Bijin, and Tekkan Wakamatsu (2nd from bottom right in photo above) from Yamatozakura will be visiting NYC and Hudson, NY to introduce their products to the US market. A weeklong series of tastings and pairing dinners will kick off on Monday, July 25th and run through Saturday, July 30th. Satsuma Shima Bijin is a collaborative among 7 small shochu makers in Kagoshima Prefecture who blend their shochu into a brand called Satsuma Shima Bijin, a mild, easy-drinking sweet potato shochu that’s widely available throughout Japan (and managed to save those small companies). Sugimoto-san will also be pouring one of their premium shochu (he’s holding the bottle in the photo above), which is a clay pot aged, higher proof version. Yamatozakura is a very small family run distillery that’s been making shochu since the 1800s, now lead by Tekkan-san. His father still runs the still while Tekkan does the heavy labor. 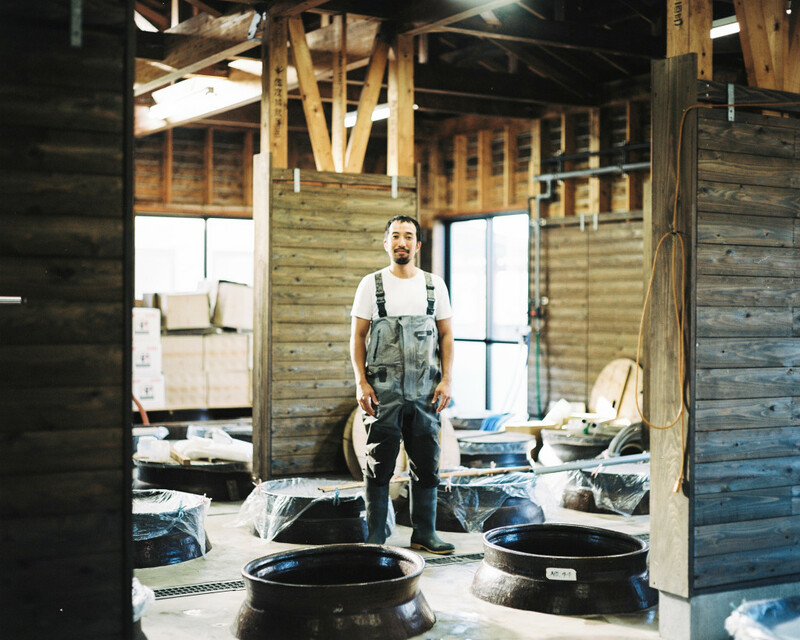 This is the place I go each fall to help make shochu. You’ll be able to try two different products from Yamatozakura – their main brand and one made with red sweet potatoes. Photo courtesy of Hideaki Hamada (C) 2016. Monday, July 25th, Jimmy’s No. 43. Shochu Tasting & Food Pairing from the chefs of The Crimson Sparrow – John McCarthy and Ryan Tate. 6pm until we’re out of food. Wednesday, July 27th, En Japanese Brasserie. Come see how these premium shochu pair with Japanese food in a Wednesday night installment of Shochu’sday. Thursday, July 28th, The Brooklyn Kitchen. Come learn all about shochu from certified shochu adviser, Stephen Lyman and try these shochu when paired with unique ingredients ranging from pickles to chocolate. Friday, July 29th, The Crimson Sparrow. If you missed Monday’s event, take the trip up to Hudson, NY to visit the amazing restaurant of John and Ryan. Shochu available by the glass. Saturday, July 30th, Tori Shin. An exclusive tasting menu prepared by chef Atushi Kono along with 4 shochu pairings. This will be an amazing, once in a lifetime experience to eat Michelin starred yakitori served by the chef along with shochu not even available in the U.S.
For more information, join our Kampai! Facebook Group or check us on Twitter @KampaiUS.